The weatherman clearly hasn't got the memo yet, but we have officially entered spring... YAY! We may have snow on the ground but the sun is starting to shine. I believe it is time to start adorning our very favourite spring fashion trends. YAY! Every year we see some returning faves including pastel colours, floral patterns and flowing fabrics, but 2018 is bringing some new looks to your spring time wardrobe. Check out the hottest spring trends to hit the 2018 high street! I hope you love them as much as we do. Step aside stripes, there is a new pattern in town! Checked dresses are the new kids on the block, coming at us with various patterns from gingham to simplistic lines. The most popular style for checked dresses at the moment has to be the pinafore dress. This cutesy school girl look has been given a big girl update adding better shapes and a more flattering finish. This Gingham Pinafore from Miss Selfridge gives me Summer School Dress flash backs. I would love to see this spring dress teamed with a cute pair of Platforms and a cropped jacket to bring back those popular 90s vibes that are everywhere at the moment. The style of this White Check Pinafore lends itself to some serious spring time layering. You can keep it monochrome with a simple black tee, or add a splash of colour to brighten up your day. Keep your layers blocked though, we don't want to lose the gorgeous simplicity of this print! Next up we can go a little western with this adorably cute Superdry Knot Dress from House of Fraser. This dress needs a pair of ankle boots and denim jacket, to keep the trend going, but also to keep warm in the fresh spring breeze. Checked shirt dresses are always popular throughout any time of the year. The versatility of this Checked Shirt Dress shows the very reason why this style never loses its popularity. Team with bare legs and simple boots, or knee highs and some tights, depending on your favoured look. A personal fave has to be this Checked Pinafore Dress from Dorothy Perkins. The delicate splash of pink pays homage to another popular spring fashion trend... Pastel colours! Springtime has always been synonymous with subtle pastels shades. From lilac to coral, mint green to peachy pink we all have a favourite pastel hue and Easter is the time to revive them and your wardrobe from the decidedly dull winter palette. 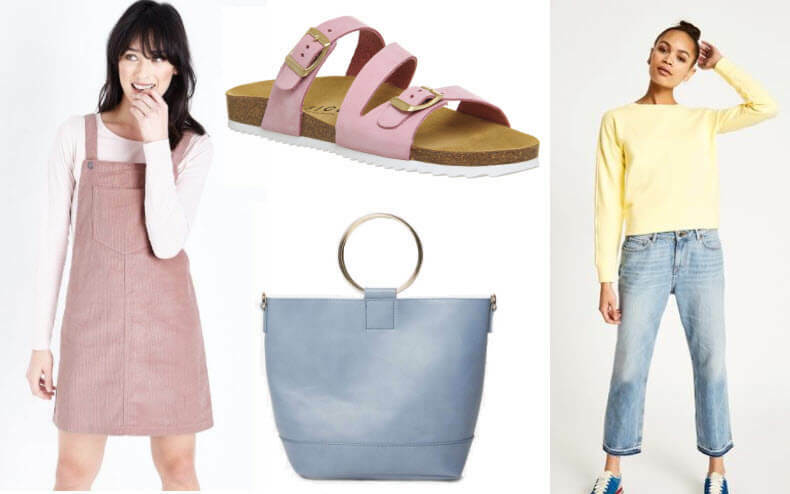 Below you’ll discover a few of our current pastel picks from the high street. First up is this adorable Baby Pink Corduroy Pinafore Dress from New Look. We love the layering this dress enables you to do. Staying warm if the day is unseasonably chilly or not if it’s mild, the large front pocket gives a relaxed feel. The perfect outfit for an Easter Sunday egg hunt if you ask us! Another bonus is that the cut is very flattering, easily skimming over any problem areas. Find it at New Look for only £19.99. Next up we have a pair the ever popular Footbed Sandals, again in pastel pink. The footbed style soles of this sandal were made famous by Birkenstock and are well known for their comfort. The shoes actually mould to the wearer's feet. This pair from Office Shoes are sure to become your next staple spring footwear and they’ll only set you back £29.99. This little baby blue number from Dorothy Perkins with the metal hoop handle is one of the hottest looks of the year. The design is modelled on a similar Chloe bag and imitations are popping up everywhere, luckily without the designer price tag. Again, the light delicate colours evoke feelings of springtime and warmer days. It’s only £15.20 right now! The brightest offering we have on the pastel fashion front is this yellow sweatshirt from Jack Wills for £49.95. With long pipped sleeves and a boxy shape, this jumper is made for Sunday shopping sprees or relaxing at home after a hard days grind in the office. It is also available in baby blue but we love the sunshiny feeling you get with the yellow. Wide Leg Trousers - Bold and Fabulous! So the skinny jean and legging has ruled the fashion trend for legs for a good few years now. Showing off those shapely pins and packing them into tight fitted fabrics. Looks like this trend is coming to an end with a new influx of wide legged trousers coming into our hottest fashion brands. This look is a true statement look, offering powerful colours, patterns and shapes. These Bold Stripe Wide Leg Trousers from Miss Selfridge offers everything you need for the hottest spring 2018 look. Strong stripes and a gorgeously wide leg, they create an instant appeal. Team with a pair of heels, a black bodysuit and jacket for a day or evening look. I quite like the idea of wearing trousers to a wedding. If worn with the right top and accessories it offers something a little different to your standard lace pencil dress. These White Wide Leg Trouser from House of Fraser would be ideal for a wedding or spring/summer event. So elegant and classy, they can also be worn with a variety of colours, meaning you can wear them to more than one event. Another trend that has swept 2017/2018 is the Co-ord. The matching sets can be worn together, or with other items offering versatility. I love the print to this Wide Leg Trouser Co-ord, from Boohoo, although I would seriously consider wearing something alongside that bralet if for daywear... chilly! If you want to make a statement, these hot mama Red Paper Bag Waist Wide Leg Trousers are all you. Surprisingly affordable, you can buy these from, Boohoo and would be ideal for a night out with the girls. Adorn with your highest heels to complete this stunning look! There are so many gorgeous trends flooding into our favourite stores at the moment, the change of season is so exciting bringing new colours, shapes, styles and fabrics. We would love to hear what trend is your favourite, so feel free to message us on our Facebook or Twitter pages!